On a sunny day about a week ago, I rashly decided to clean the french-windows and was in for a surprise! The hinge was half-full of ladybirds (ladybugs if you’re USA) … and they started crawling up the frame almost immediately – so I knew they were alive! Now my default reaction to any creature inside the house that shouldn’t be is to carefully get it to where it should be, and especially if a beneficial creature, can thrive. [I will admit that I’m not keen on clothes-moth survival inside the house] But my first reaction to ladybirds is that they are ‘GOOD THINGS’ and so require rescuing and putting where they can survive and thrive! Less than a week later they hatch and set about finding food. They look nothing like a ladybird, black or dark brown with spiky bits sticking out and a long shape – rather than round. They go through four stages of growth, splitting out and growing a new skin, (instars), before sticking their tail to the underside of a leaf and pupating. About a week later the pupae, which is now large and rounded, splits and a pale ladybird pushes it’s way out. After the wings have expanded and dried the wing-cases become their recognisable colouration, and spottiness, and it is ready to move off, to eat aphids or other small insects. Most then hibernate for the winter and only emerge to mate in the Spring. A few types, however, can have a number of generations in one year. Little voices can often be right – and yes, a fuss was made back in 2004! when the first of these were spotted in the UK. They are an Asian ladybird, the Harlequin ladybird – as they come in so many shades and spot-levels – and were first introduced to America and then to some European countries to biologically control aphids. How to identify harlequins. They appear to have arrived in the UK just by accident, and like it here, multiplying exponentially! 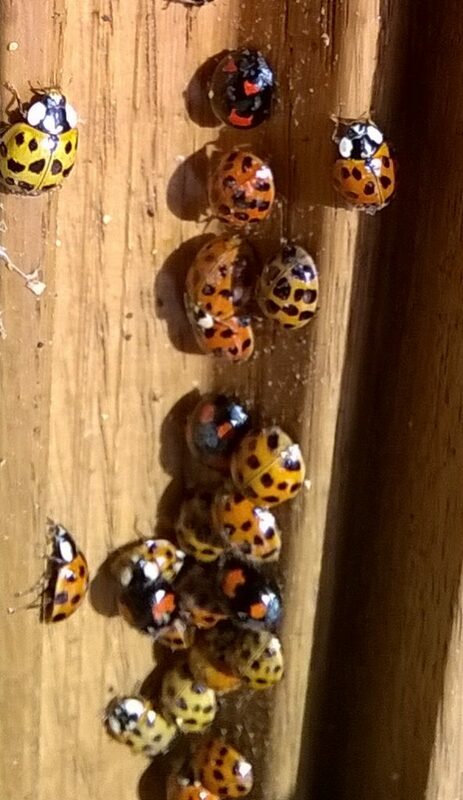 They are voracious eaters … unfortunately they also eat the eggs and larvae of other ladybirds, including our native ones, especially the two-spot ladybird that shares a liking for the same environments. So, having rescued these and popped them into the greenhouse … I am now at a quandary as to what to do with the others. Oh, yes, the others! Every sunny day more appear marching around the inside of my window. 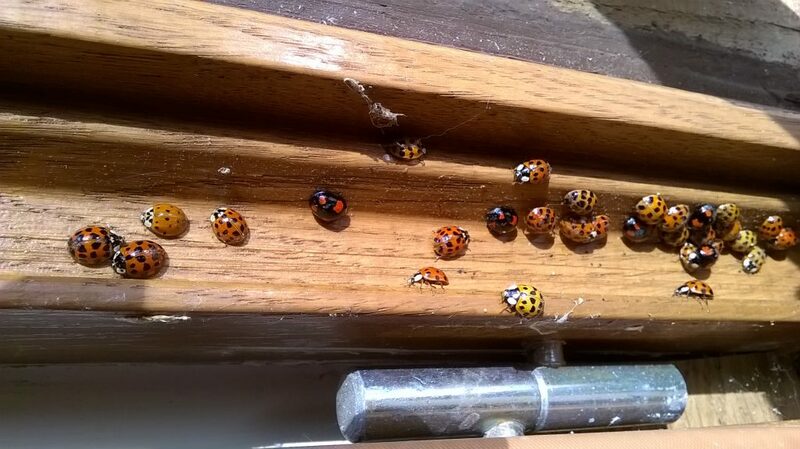 I’m not sure where these are hiding, but in a converted barn there are plenty of cracks in timbers that could offer a nice snug hiding place for ladybirds. Right now there’s 14! It must have seemed a good idea at the time to use this biological control … When will start learning not to mess with nature?